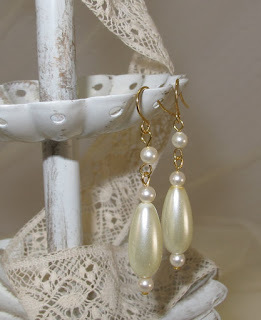 Pearls are a timeless classic that have been prized for centuries. They are mentioned in the Bible and in ancient Chinese and Roman records, for example. 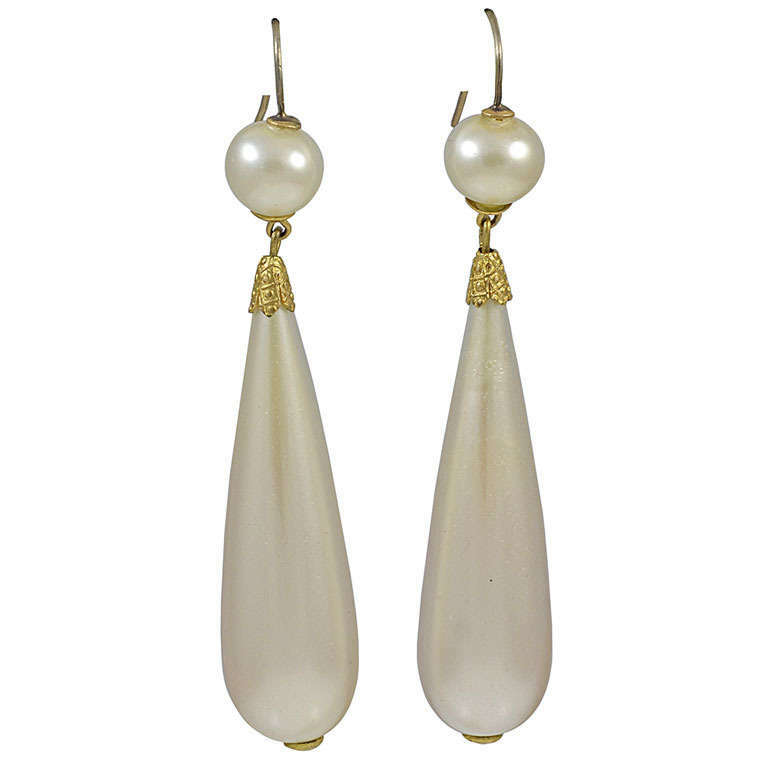 Natural pearls were rare and expensive so that only the wealthy could afford to own them. In fact, they seem to have been quite the status symbol. 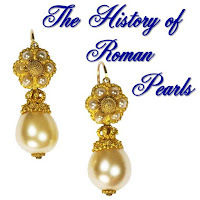 The Roman emperor Julius Caesar passed a decree mandating that only aristocrats could wear pearls within the boundaries of Rome. As with many expensive products, efforts at creating a cheaper look-alike alternative to the natural pearl were sought. Several attempts are notable. The ancient Romans coated glass beads with silver and then over-coated with glass again in an attempt to replicate genuine pearls. Another idea was to coat small balls of clay with mica powder and then bake them. Later on glassmakers in Venice came up with a couple of approaches. One was to use powdered glass and egg whites, and snail slime, and the other was to use shells and fish scales. The faux pearls were apparently so authentic looking that the Venetian pearl merchants successfully lobbied to make it illegal to produce them. Eventually elsewhere in Italy another process was invented, that of using alabaster coated with an essence extracted from fish scales. 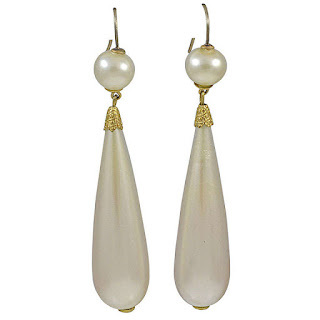 These were called Roman Pearls. Also, in the 1700s a Paris rosary maker, M. Jacquin, patented a method using hollow blown glass spheres that were coated on the inside with ground fish scales and then filled with wax to give them a weight similar to a natural pearl. 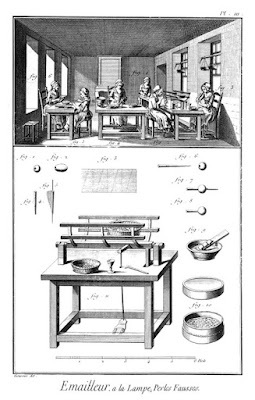 A plate from Diderot’s "Encyclopédie"
In A History of British Fishes, published in 1836 by William Yarrell, he gives details about the extraction of the pearlescent lustre from the scales of the fish. On the inner surface of the scales of Roach, Dace, Bleak, Whitebait, and other fishes, is found a silvery pigment, which gives the lustre these scales possess. Advantage has been taken of the colouring matter thus afforded to imitate artificially the Oriental pearl. When this practice was most in fashion, the manufactured ornaments bore the name of patent pearl, and the use was universal in the bead-trade for necklaces, eardrops, &c. At present, it seems confined to ornaments attached to combs, or small beads arranged with flowers for head-dresses. So great was the demand formerly at particular times, that the price of a quart measure of fishscales has varied from one guinea to five. The Thames fishermen gave themselves no trouble beyond taking off the side scales, throwing the fish into the river again; and it was the custom for hawkers regularly before selling any white-fish, as they were called, to supply the beadmakers with the scales. The method of obtaining and using the colouring matter was, first carrying off the slime and dirt from the scales by a run of water; then soaking them for a time, the pigment was found at the bottom of the vessel. When thus produced, small glass tubes were dipped in, and the pigment injected into thin blown hollow glass beads of various forms and sizes. These were then spread on sieves, and dried in a current of air. If greater weight and firmness were required, a further injection of wax was necessary. Of this pigment, that obtained from the scales of Roach and Dace was the least valuable; that from the Bleak was in much greater request; but the Whitebait afforded the most delicate and beautiful silver, and obtained the highest price, partly from the prohibitory regulations affecting the capture of this little fish, the difficulty of transmission, and rapid decomposition. 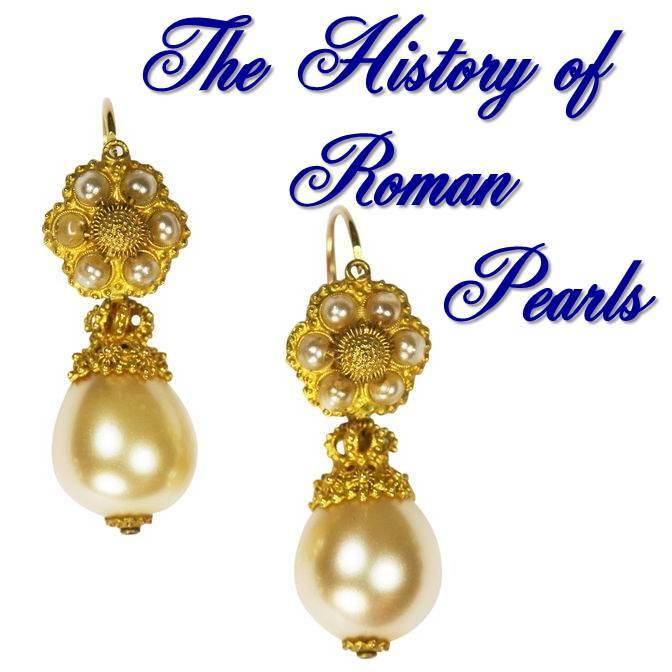 Before too long mass-production of faux pearls, sometimes called Roman Pearls or Parisian Pearls, was underway in a number of places, enabling more than just the aristocracy to afford them. Some of these interior-lined-glass processes endured until WWII. 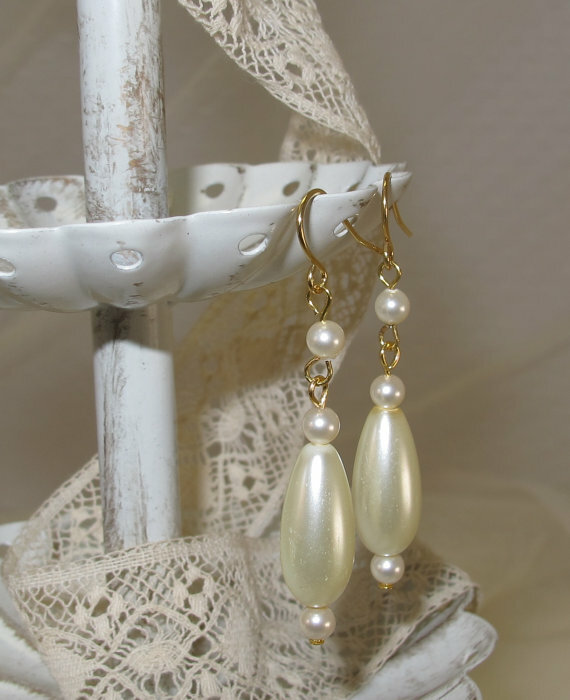 So regardless of which era you portray in reenacting - or even for your modern outfits - wear your lovely faux pearls knowing that you are carrying on a time-honored tradition! 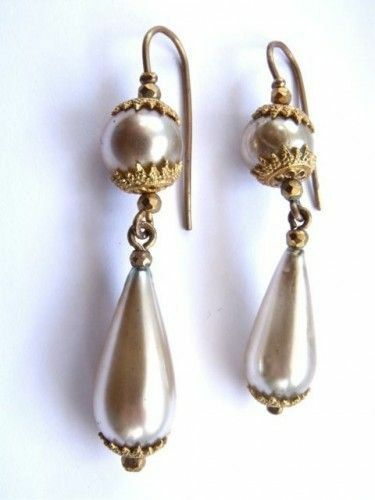 Georgian Roman pearl earrings. Seen on 1stdibs.com. If you're looking for a pair in mid-Victorian style, I have a number of options in my Etsy shop. Enjoy!